That's his nickname, acquired being first on the scene to shoot the effects of booby-trapped cars during his native Lebanon's civil war. 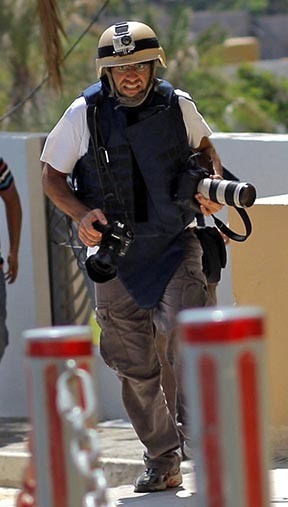 His real name is Patrick Baz and he's a 52-year-old Lebanese-French veteran of too many killing fields that he admits ultimately take a heavy toll on photojournalists and war correspondents. "When I was a kid I considered myself invincible and out of reach from PTSD," he said of post-traumatic stress disorder, a mental health condition triggered by terrifying events. "I believed and I still hear myself talking about how PTSD is for text colleagues and that my camera is my shield and that I'll never be affected by what I was going through, etc." Asked whether photojournalists needed to take time off for rest, relaxation and therapy treatment after their tough assignments, Baz said they should, before it gets worse. "A therapist asked me recently 'did you see lots of body parts and disturbing scenes in your career?' I answered him, 'did you see lots of deranged people in yours?'" Baz replied sarcastically. There's also been a toll on his 19-year-old daughter. "Once, I was listening to a news report about a huge car bomb in Iraq while I was driving her to a friend - she was 9 - I heard her tiny voice from the back seat of the car 'I don't want you to go there anymore I don't want you to get killed.' It was a slap in the face. But I kept going." It's been an illustrious career, mostly with Agence France-Presse (AFP), the international news agency he joined in September 1989. 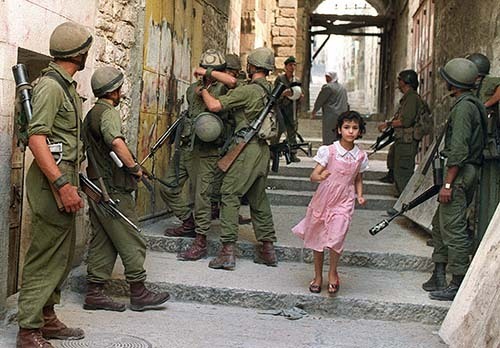 "Photojournalism is one the very few jobs that you can't do if you don't like," he said. His name is synonymous with AFP. Today he's AFP's photo manager for the Middle East and North Africa, overseeing a phalanx of some 80 photographers from a regional base in Nicosia, Cyprus. In addition to running the shop, he still goes out on occasional assignments, juggles budgets, is in charge of purchasing photo equipment, undertakes photo editing, coordinates his charges' whereabouts, monitors activities and trains photographers - and not only AFP's. 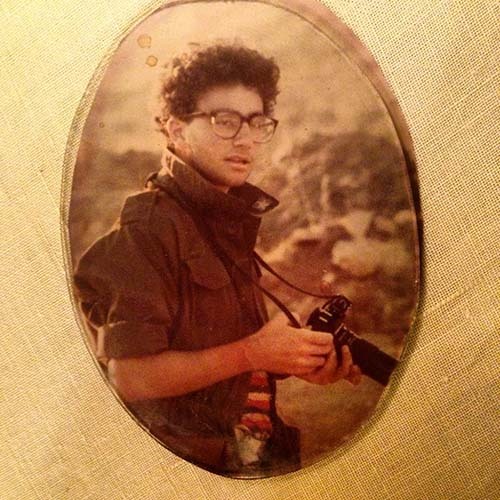 Baz stumbled into it, by default, courtesy of a raging 15-year civil war in Lebanon, during which he'd go out with friends using his father's Contaflex camera to capture battles, scenes of destruction, and some semblance of life in that war-torn country. It was a far cry from what his parents had hoped he'd become: a doctor, lawyer or engineer. He, in fact, wanted to be a pilot. His first forays were as a freelancer, selling pictures to Paris Match magazine, TIME, Newsweek, Stern, Der Spiegel, L'Express and L'Espresso, to name a few. 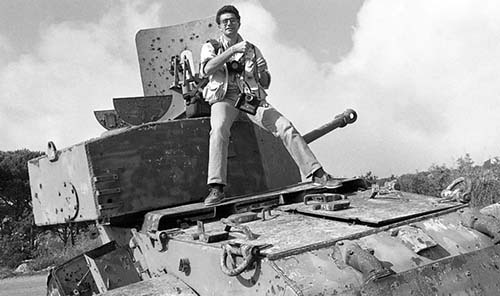 He doesn't mind being called a war photojournalist. "I've worked and lived in conflict zones for three decades so I guess it does apply to me," he said. "That doesn't mean I only photographed death. No. I kept searching for life in all the conflicts I have covered. And most of my war pictures contain a reference to life." A picture dated March 2, 1987 is of French musicians performing amidst the rubble of Beirut's Christian neighborhood of Ain Al Remmaneh along the "Green Line" that divided the city at the time. He covered the first Palestinian "intifada" (uprising), the Gulf War of 1991, as well as conflicts in Kurdistan, Somalia and Bosnia. Fast forward to conflicts in Iraq and Afghanistan where he was embedded with U.S. Marines, many of whom weren't even Americans, he said, noting the generation gap and cultural divide between him and the twenty-somethings whose conversations centered on American football and baseball. "What readers need to understand is that when a journalist is embedded with a combat unit, he's like a foreign object that is being attached or integrated to your body. It takes time for your body to get used to it and adapt," Baz explained. Aside from lugging cameras, lenses, and donning a flak jacket, he also attached a GoPro camera to his helmet to free his hands when the need arose to maneuver in difficult situations. More recently he's done time shooting the Arab revolutions in Egypt and Libya. Today's digital equipment makes it easier taking and deleting unwanted images than being encumbered by rolls of film and other tools of the trade that used to slow the process of transmitting photos around the world. "It is like asking me if it is easier to drive an old Ford T or the latest fully-equipped SUV," Baz said, adding that he used to spend all his money on films, developing and printing. It's not all battlefields and body parts. Taking pictures is Baz' therapy he says and an ever-present camera is there to capture the most mundane of scenes. On a flight from Dubai to Beirut I saw him shooting cloud formations. He posts some of his pictures on Instagram (@patrickbaz) and publishes some on the AFP wire but most end up on his hard disk. 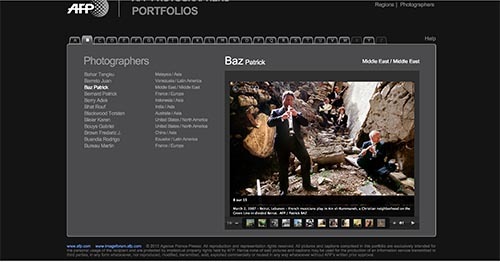 On a lighter note, Baz has served on international photo competition juries and twice won the Picture of the Year International award.